The Nedo Aluminum Leveling Rod is a reliable grade rod that provides superior stability to ensure accurate measurements at all times. Its rectangular shape is designed for easy grip and convenient handling while working. A snap-on rod level is available (not included) to allow quick and precise alignment and positioning. 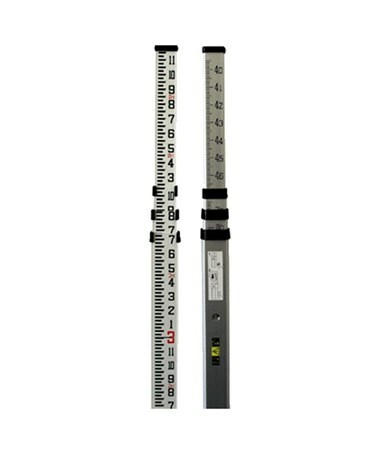 With its high-strength aluminum construction, this Nedo leveling rod is a perfect tool for all construction and surveying professionals. It can reach up to a maximum length of 13 feet or 16 feet when fully extended. It has metal-enforced locking buttons that securely hold its telescoping sections in position to prevent them from slipping when in use. The Nedo Aluminum Leveling Rod offers easy readability with its highly visible graduations in feet and tenths or feet and inches. It enables overall height readings with its scale on back. For convenient storage and transport, it collapses down to a more compact size. It includes a one-year manufacturer’s warranty for guaranteed efficiency for a long period of time. 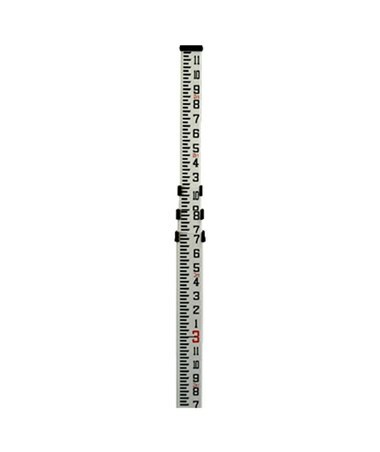 The Nedo Aluminum Leveling Rod is available in varioust length and scale options to accommodate most construction and surveying applications. Please select your preference from the menu above.